One of the things we pride ourselves on at LSBU is the opportunity for our students to work collaboratively, without barriers. Rather than keeping our knowledge in different areas separate, we provide plenty of chances for students from different courses to work together, learning from each other as they do so. One such example is GANGS, a collaboration between second year LLB (Hons) Law student Benoit Chaves and third year BA (Hons) Journalism student Rafaela Kuznec. Sponsored by Envy Post Production and high quality photography provided by author Prodeepta Das, the documentary highlights and examines the influences and consequences of gang culture, and the economic and social circumstances of disenfranchised young people. The pair met after a law lecture, when Benoit began talking to a group of Multimedia Journalism students about his idea of filming a documentary. It was Rafaela Kuznec who was most impressed – the pair clicked, and she agreed to help Benoit bring his ideas to life assisting with interviewing, filming and editing. Making the documentary itself was fairly straightforward. I had plenty of people lined up to give their thoughts on gang culture. We also had plenty of support from LSBU, who provided us with high quality filming equipment and the hardware and software we needed to edit the documentary. GANGS sets out to create awareness of the hurdles that young people all over the UK face when it comes to escaping gang violence and crime, and has been created as part of a wider campaign by Benoit’s social enterprise VC & CHANCE. The group is dedicated to helping gang members work with educational institutions and government and community programs to further their educational or career prospects, as well as making parents, social workers, teachers and members of the community aware of the influences, activities and consequences of youth gang culture. The GANGS features exclusive interviews with active gang member and East London rapper Mini Sparks, Newham MP The Rt (Hon) Stephen Timms, former Enfield North MP Nick de Bois, NACR Manager David Idiabana and Middlesex University criminologist Ian Joseph, an expert on gangs. It’s part of a wider campaign by the group to help young people in gangs to turn their back on crime once and for all. 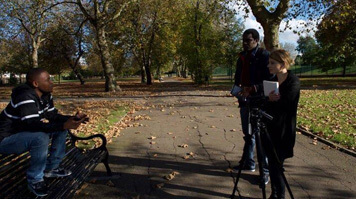 Next up in VC & CHANCE’s plans is the production of a feature film, London Hoodz (written by Benoit and D’Script) in collaboration with Award winning director Fredi ‘Kruga’ Nwaka. Several rap celebrities have shown interest in featuring in the film these include Yungen, Cadet and Potter Payper. To produce the film 65 volunteers are currently being sought to help work on the actual production and projects that will raise the funds required to make the movie, co-penned by Benoit, into a reality. With GANGS now officially launched, VC & CHANCE is now looking for venues to show the documentary to larger audiences and host discussions about the issues raised. Owners and managers of cinemas, community halls and venues with screening facilities are invited to contact the group at vcandchance@mail.com, as are schools and community centres interested in holding a screening. Find out more about the work carried out by VC & CHANCE, or see more work produced by Journalism students at LSBU.